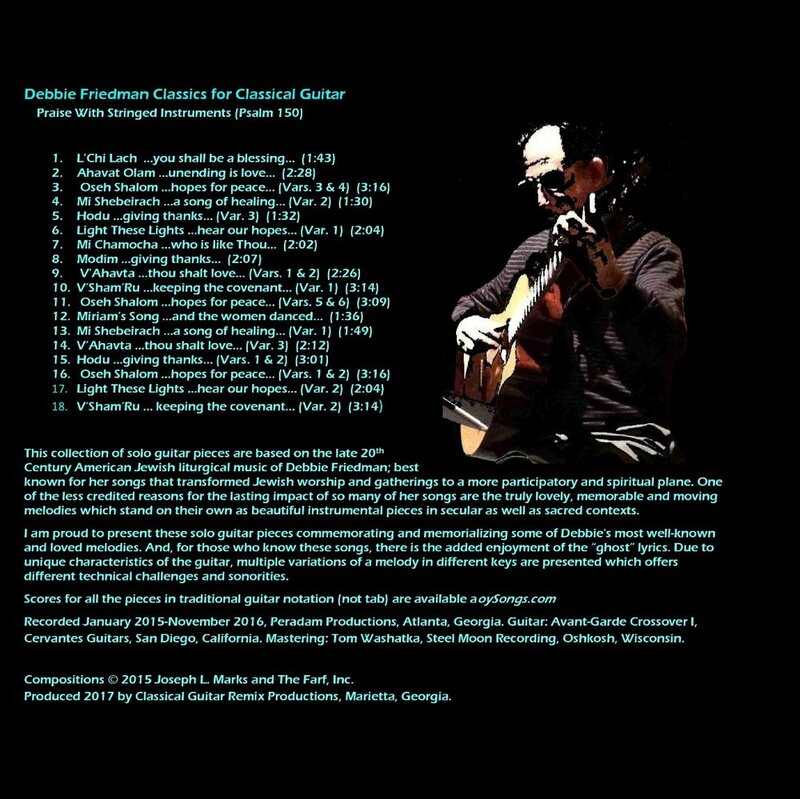 Classical guitarist Joe Marks has released two albums of his arrangements of 18 Debbie's songs. They are available on oySongs as digital albums and sheet music. L'CHI LACH contains all-Hebrew versions of the songs of Debbie Friedman. Israeli musical artist, Bat ella Birnbaum’s album, L’Chi Lach: Bat Ella Sings Debbie Friedman, is a stunning tribute to Debbie and gift to us all. The deep love Debbie and Bat ella had for one another is reflected throughout. Each of the compositions are translated to Hebrew, while maintaining the integrity of Debbie’s lyrics. The melodies stay true to Debbie’s – note for note. In Bat ella’s words, “L’Chi Lach contains thirteen of Debbie’s songs, the most meaningful to me from among the hundreds she wrote.” The photographs on the jacket and insert are works of art. Each track’s description presents the Hebrew lyrics, English translation, and transliteration, making the recording very user-friendly. Bat ella sings Debbie’s last composition, “Shalom Aleichem.” It is the one song on the recording that Debbie did not live long enough to record herself. Debbie believed that this song would be her signature song, as time passed. You will understand why Debbie’s prediction was accurate when you hear Bat ella’s recording. "Our family is grateful, beyond measure, to you, dear friend, for this beautiful tribute to Debbie. She has created a brilliant work of art that is a gift to Debbie and a gift to us. Anyone who knew Debbie knows that one of her unfulfilled dreams was to share her music with the people of Israel. Now, Bat ella has fulfilled that dream for her. With love to our dear Bat ella." "Bat ella has given the Hebrew-singing Jewish world an amazing and heartfelt gift: Debbie Friedman's greatest songs! In a beautifully crafted disc filled with Bat ella's luscious voice and exquisite Hebrew versions, we now have a repertoire for many settings. Israelis love to sing, and while our Hebrew culture is rich with Hebrew songs, only recently have Israelis begun to create a modern beat to classical prayers. Debbie Friedman was the pioneer of this field in America. She became our beloved songstress in the English-speaking world, and most Israelis never heard of her. Now, with this lovely disc, Bat ella gives us another voice to sing, pray, celebrate, mourn, and rejoice!"